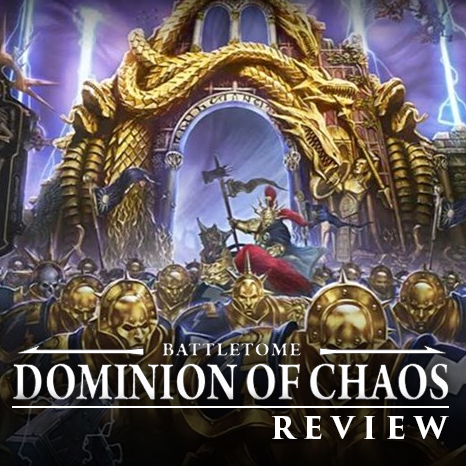 The new Dominion of Chaos Battletome is coming out and I was lucky enough to get an early look at it. This is very much the counterpart to the Dreadhold Battletome that came out almost a year ago, full of warscrolls for the scenery we use in our games of AoS, along with Battleplans, and Warscroll Battalions. The first thing I noticed on this was the cover. I really like the artwork used here. I don't know why, but something about the composition and the colors used just looks really cool. It's hardcover like all of the other Battletomes, but decidedly thinner, just like it's Dreadhold cousin. This is reflected in the price though, coming in at only $33. Once you crack it open we are thrown right into the Battleplans, which there are four of. Each of these has a small bit of story accompanying it, just like in the normal battletomes. The first one is The Dragonfate Dead, and unsurprisingly, revolves around a Dragonfate Dias. The opening piece of artwork for this is my favorite from the book. That is one awesome looking Dragonfate Dias and I would love to see someone convert their's up to look similar. The story has a contingent of Stormcast Eternals of the Hammers of Sigmar led by a Lord-Relictor head into Shyish to retrieve the remains of some War-Priests. These warriors of Sigmar perished in the Realm of Death and Nagash refused to allow the remains or spirits to go back to Sigmar. Instead the were interred at a Dragonfate Dias. The Stormcast must battle their way through an alliance of Flesh-Eaters and Nighthaunts and are able to magically revive the fallen War-Priests to fight on their behalf. After this there Realmgate closes, so they must also reopen it through the magic of the Dias all while fighting to stay alive. The battleplan itself seems pretty fun and unique. A Dragonfate Dias is set up in the center of the board, with the defender's deployment zone encompassing three-fourths of the board going lengthwise and the attacker getting the remaining quarter along one of the short board edges. To win they must get a hero to the Dias where they must do two things. The first is to resurrect the fallen dead around the Dias, and the second is to intone the Word of Power to reopen the Realmgate. This can only be done after the dead have been resurrected though, and they cannot both be done in the same hero phase. To make things more interesting the attacker's command ability is to basically deputize other models into becoming a hero for the rest of the game. This can be any model you chose, at which point it must leave its unit. This gives you a better chance of completing your actions at the Dias. However, the defender's command ability makes it so that any enemy heroes within 3" of one of your units cannot do anything in the hero phase that turn, essentially preventing them from winning. To win the attacker must intone the Word of Power and for the defender they must kill the enemy general and all other heroes. I love the competing command abilities and I feel like this could lead to some very tense and fun moments in the game where you think you have the upper hand only to be countered by your opponent. I definitely want to give this one a try at some point. The second battleplan has a bunch of Skaven attempting to open a Realmgate into Nurgle's Garden deep within Ghyran, which of course the Sylvaneth are having none of. The story is pretty straight forward and just has the rats attacking the Sylvaneth as more reinforcements from both side continue to pop up, either from hidden glades or vile gnaw holes. This is reflected in the battleplan rather nicely, with the board divided up into six sections. If you have a Realm of Battle table this is as simple as using each two foot square as one of the six sections. These are then numbered one through six. To start each player can only deploy up to three units and before deploying each one they must roll a dice to determine which section they go in. This could result in you deploying a unit within the same two foot section as your opponent. In each turn you can bring on one new unit, which also must roll a dice for which section it will appear in. You can activate the Reamgate which then allows you to bring on two units and they come on from the Realmgate. The winner is whoever has a model within three inches of the gate at the end of six turns. I really like the random nature of this battleplan and how it will force you to quickly adapt your tactics since you will never know where you are going to end up. This is another definite try for me at some point. The third battleplan revolves around the idea of a combat arena. In the story a band of Bloodbound stumble through one of the Realmgates that line its circumference and discover some Ogors who have also found their way into it. It's a rather fun story with the Ogors bringing in some unexpected reinforcements and a really cool final confrontation between the two opposing leaders. The battleplan itself has three Realmgates set up in a triangle and the arena is the area between them. You can leave the arena, but then you run the risk of upsetting the gods and suffering some mortal wounds as punishment. If you decide to travel through the gates you have to roll randomly to see what one you pop out of. There is also the chance you won't ever return, or that you'll bring some reinforcements with you from another realm. The victory conditions are pretty straight forward in that you just have to either completely wipe out your opponent or at least all of their starting models, so the reinforcements don't count. I like the idea of the combat arena, and at the start of the battleplan it suggests this could represent Sigmar's gladiatorum where the Stormcast train, which seems really cool to me. The victory conditions could make this one go on for awhile though. If it were me I would set a turn cap and then compare who had killed the most by then. The final battleplan features a Numinous Occulum and a pair of sorcerers who want to control it. The story features a Tzeentch sorcerer who is using this particular Occulum to try and regain entrance into Tzeentch's realm, but is unexpectedly confronted by the Seraphon. Again, this is a rather fun little story, and the ending was a nice surprise I didn't see coming. The battleplan has the Occulum set up in the defender's deployment zone and it grants extra abilities to the one who controls it. Mostly bringing on extra reinforcements or bringing back dead models in an already depleted unit. The attacker has a chance to destroy the Occulum if it can get close enough. The game lasts for six turns and to win the attacker must completely wipe out the defender's army. In this scenario the attacker is supposed to outnumber the defender, which I think is pretty important for this scenario to work properly. It's an interesting battleplan and could be a lot of fun. I personally like playing scenarios where one side outnumbers the other. It adds some tension to the game. After all of the battleplans we get a small gallery section just showing a bunch of armies fighting over the different scenery and the new Shattered Dominion game board. They are what we have come to expect from GW at this point and are fun to look at. The armies here are all Stormcast, Khorne, or Nurgle mostly. This is followed by the warscrolls for all of the scenery, most of which we have seen already. We do get two new ones though, the Fell Chasm and the Arcanabulum. These are specific tiles on the new Shattered Dominion board. The Arcanabulum rules are pretty interesting but I won't go over them here since you will be able to just see them in the App. There are a few warscroll battalions too, like a group of three Realmgates, several Ophidian Archways with a Dragonfate Dias, and more. They're fun additions to the game just like the ones from the Dreadhold book. Dominion of Chaos is a nice addition to any AoS collection, especially if you are like me and like your rules printed in a book instead of on the App for games. All of the battleplans are fun with the first two being the standouts for me. It does seem like this book may have been meant to be released earlier. I only say this because of the armies featured in it are all early AoS armies, but none of this detracts form the book at all, it's just interesting. If you are looking for some more fun battleplans, enjoy printed rules, or are just an AoS completionist than this is a good book to pick up, especially at only $33.